My husband has been home from the rehab unit for a week now. I started back at work yesterday. Things are starting to settle a bit but I still feel like I am walking in the opposite direction on a moving merry-go-round. I am buried at work with backlog from my time out of the office. I tried to work from home but I could only do it in short spurts because of everything that has been going on. We have had a string of people in and out of the house – visiting nurses, physical therapists, occupational therapists. We saw the surgeon on Monday and have an appointment with our family doctor tomorrow. And the construction is still going on resulting in banging, stone cutting and frantic dog barking. My brain feels like there is sand in the mechanisism. I try to think and it grinds to a stop. I know there are organized, rational thoughts in there somewhere but I’ll be damned if I can find them. I screamed at someone in the office yesterday and then burst into tears as soon as I was alone. The other day, my husband asked me if I had a plan for the day. Plan? For the day? I can’t think that far ahead. All I can do is think about what has to be done next. And when that is finished, what has to be done after that. And then the next thing. And so on. I used to be able to multi-task. I used to have bursts of creative ideas; moments of pure inspiration. My thought process has become very linear. Like walking through a narrow path in an overgrown forrest – I have to go slowly, one step at a time and I can’t see very far ahead. My husband, on the other hand, is doing quite well. He’s getting around with the walker like a pro. He climbs the stairs to our bedroom at night with the help of a crutch and the second handrail we installed. He made himself breakfast and lunch while I was at work. I even worry that he is pushing himself too fast. This is the man who was on a ladder taking down outdoor Christmas decorations while experiencing excruciating back pain. I’m not complaining though. Well, maybe whining just a bit. I want things to slow down a little. I want a routine again. I need some quite time, some time when nothing has to be done. I know I’m just being a big baby. I have so much to be grateful for, the biggest being the empty wheelchair. 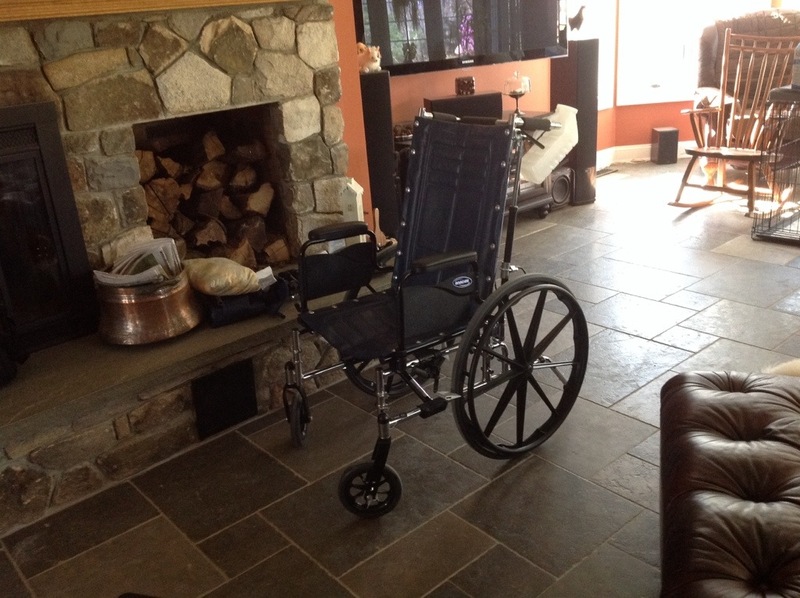 We got a wheelchair to bring home thinking we would be using it everyday. It sits empty in the family room. My husband has only used it a few times and that was to do seated exercises with the therapist. Every time I see it parked in front of the fireplace, unused and empty, the reality of the type of devastating permanent changes that we almost had in our lives, hits me full-on. All this stuff we are going through right now – it’s just temporary turbulence that will settle down over time. We’ll get through it. A little meditation, some motivational self-talk, a positive attitude, determination and prayer will do it. Oh, and a couple of vodka tonics wouldn’t hurt either. This entry was posted in Country Living, Daily Life, Gratitude, Love, Marriage, Uncategorized and tagged gratitude, Husband, Love. Bookmark the permalink. Hugs and cyber pedicure coming your way. And Tina Turner. Just because. Thanks Rose. It’s getting a lot harder to reach my own toes and when I do, it looks like Helen Keller put the polish on.